Peer into the movie-making looking glass, and you'll find the first poster for Glass, the forthcoming superhero horror-thriller from director M. Night Shyamalan. Universal Pictures recently unveiled the one-sheet, which features Bruce Willis as David Dunn, the college football star-turned-superhumanly strong security guard from Shyamalan's Unbreakable film series; Samuel L. Jackson as Elijah Price (a.k.a Mr. Glass), the mass murderer whom Dunn handed over to authorities in Unbreakable; and James McAvoy as Kevin Wendell Crumb, the man struggling to control his dissociative identity disorder and 24 distinct personalities (the most fearsome of which is his final one, known as The Beast) from Shyamalan's Split. 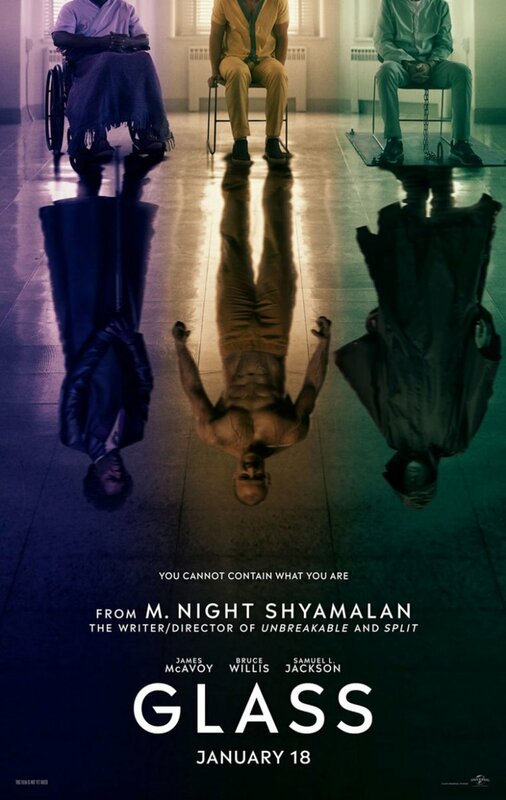 The three character sit side by side, each draped in a different color of light (Mr. Glass in purple, Kevin Wendell Crumb in yellow, David Dunn in green), with the image of their respective "dark" personas seen in reflections on the floor. A fitting tagline is stamped beneath the dangerous men: "You cannot contain what you are." Take a look at the full Glass poster below. This poster reveal comes seven months after Shyamalan announced that filming on Glass was coming to a close, and seems to indicate the official start of the promotional campaign for Glass. If Universal follows the standard "poster first, teaser second, trailer third, and maybe another trailer if we're feeling feisty" pattern with Glass that most studios do with other releases, fans likely get to see an in-motion look at the flick in the near future. 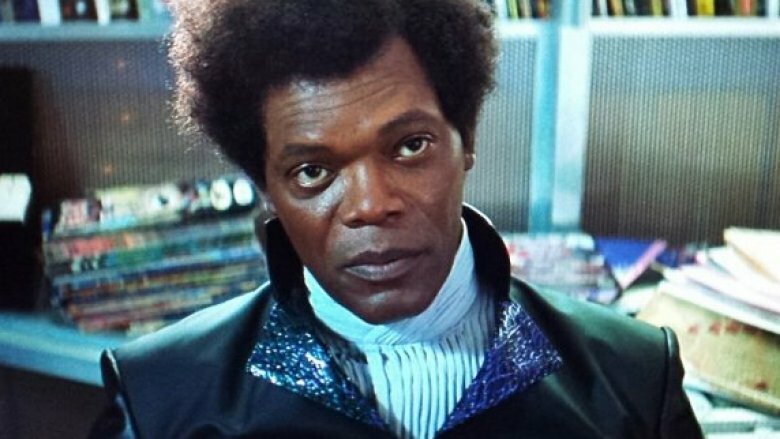 Both a sequel to Shyamalan's subversive superhero origin story Unbreakable and a follow-up to his psychological horror pic Split, Glass will pick up after the events of Split and follow David Dunn as he tracks down Kevin Wendell Crumb's Beast identity through a series of frightening encounters. In the shadows, Elijah Price looms as Mr. Glass, serving as the orchestrator of the meetings between David and the Beast and holding secrets that could mean life or death for both men. Joining Willis, Jackson, and McAvoy for Glass are Anya Taylor-Joy, Sarah Paulson, Spencer Treat Clark, and Charlayne Woodard. Glass is set to shatter on January 18, 2019.